The instrument built in 1793 by Antonín Reis (1741-1815) in the church of Rabštejn nad Střelou bears all the typical characteristics of the Czech traditional organbuilding. The size of the instrument matches perfectly the size of the church: the principal chorus is built on a Principal 4', nevertheless it includes also a Quint 2 2/3' which contributes to the gravity of the Hauptwerk plenum and underlines the contrast with the Rückpositiv built on a Principal 2'. 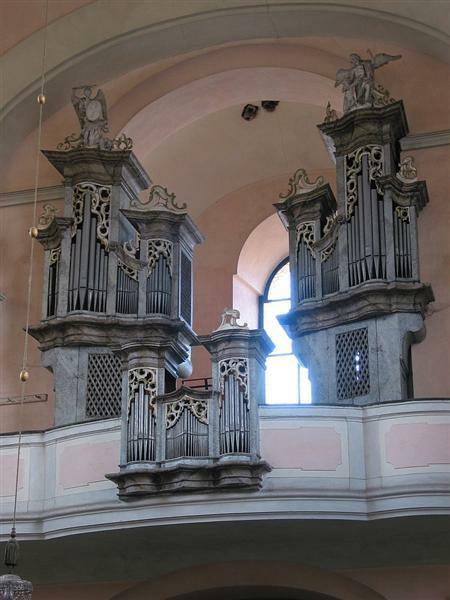 According to the view of prominent experts, this is one of very few Czech historical organs where the voicing of the Principals was never altered by later restorations and it was conserved in the original form (cited from the materials of the diocesan organ-surveyor Marek Cihar). The last major repair of the instrument was done in 1878, more than a century ago. The break in the highest octave is perhaps somewhat speculative, nevertheless, Czech organbuilders almost always built the 1' rank with a break. If more plausible solution is served, I would be happy to model it in Hauptwerk for comparison. Describing our digital model, the original version of the ODF offers the raw pitches of pipes as recorded, the extended version of the ODF offers the pitches smoothened to the above presented composition. 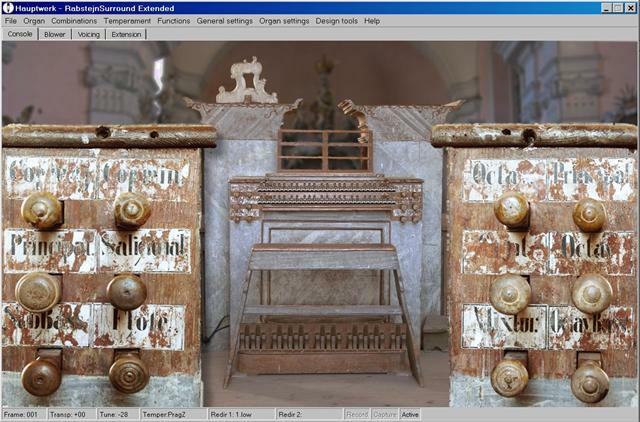 The Rückpositiv of the instrument presents the essence of the traditional Czech Chaire organ (compare it with the Peruc model, Hrubý Rohozec or larger Zlatá Koruna and the Prague baroque). It offers originally 4 stops, stopped flues 8' and 4' (called traditionally Copula's), Principal 2' and Octave 1' which breaks in the highest octave back to 2'. In the extended version of our model, I decided deliberately to create an optional aliquots Quint 1 1/3' and a Terz 1 3/5' of a principal timbre, and a Nasard 2 2/3' of a flute timbre, to allow for more pronounced solo use of the manual. The extended stopjamb is presented on a special tab, so that purists may not be disturbed by the added stops. The Pedal of the original instrument is not independent. It offers two stops 16' and 8' of a very limited compass (18 tones) and it was intended to provide support to large chords, e.g. at the very end of the musical pieces. The semitones C#, D#, F#, G# are missing in the lowest octave, but the lowest F# and G# are provided in the upper octave in place of the f# and g#. So, the scale is: C, D, E, F, G, A, A#, B, c, c#, d, d#, e, f, F#, g, G#, a. The intention was to provide the fullest great octave possible, given the limitations of the baroque short octave. This situation is reproduced faithfully in the original version of the ODF. In the extended model, I enlarged the compass to the standard 27 tones, and added a 4' Choralbass for the solo performance of a chorale melody. Rabštejn nas Střelou - regardless of its importance in the history - is today somewhat deserted location. It is one of those rare places where you feel you escaped the civilization and you are about to reach the extremities of the Earth. Perhaps thanks to this remoteness, the instrument is preserved in its ancient state. It does not even have an electric blower - in fact, there was never electricity available in the church itself (in our virtual model, we added optional artificial blower noise for those who like to hear it). On the other hand, this instrument is more than others threatened by the long-term lack of regular care and its slow decay seems inevitable. It is not an exaggeration to say that we were perhaps among the last people who found the instrument in a playable state. We are happy, and perhaps even proud, that we were allowed to capture its tonal characteristics for future digitally.